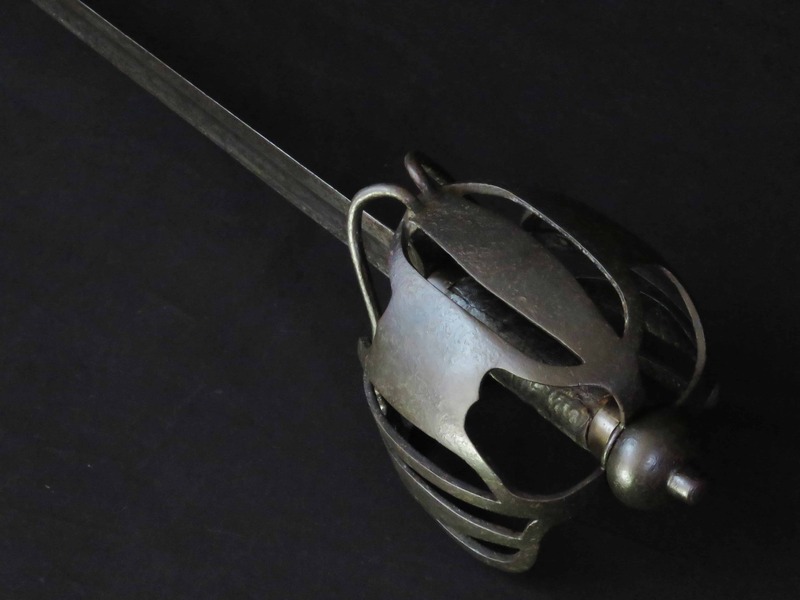 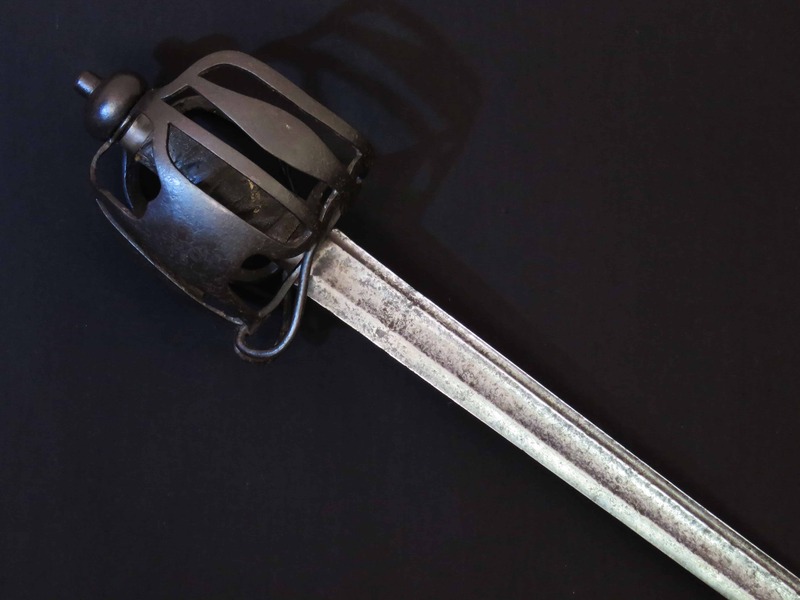 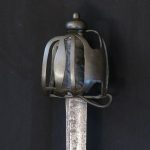 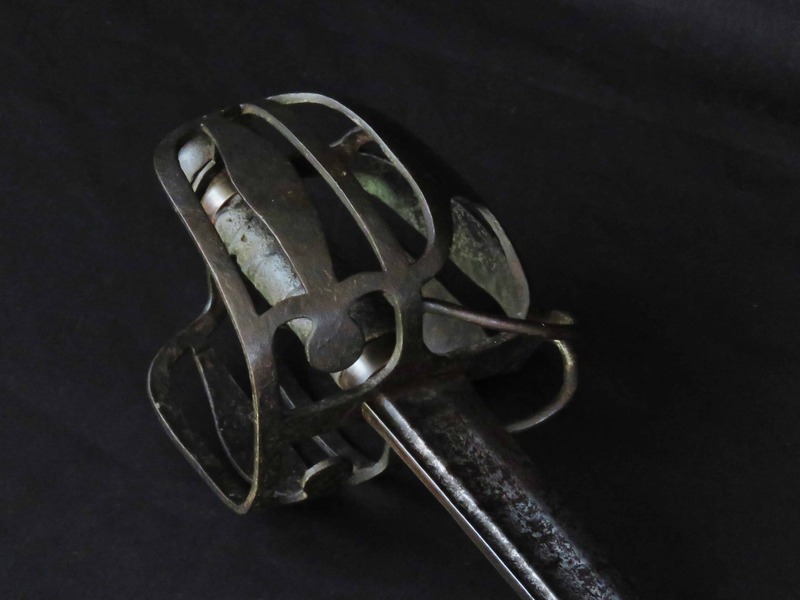 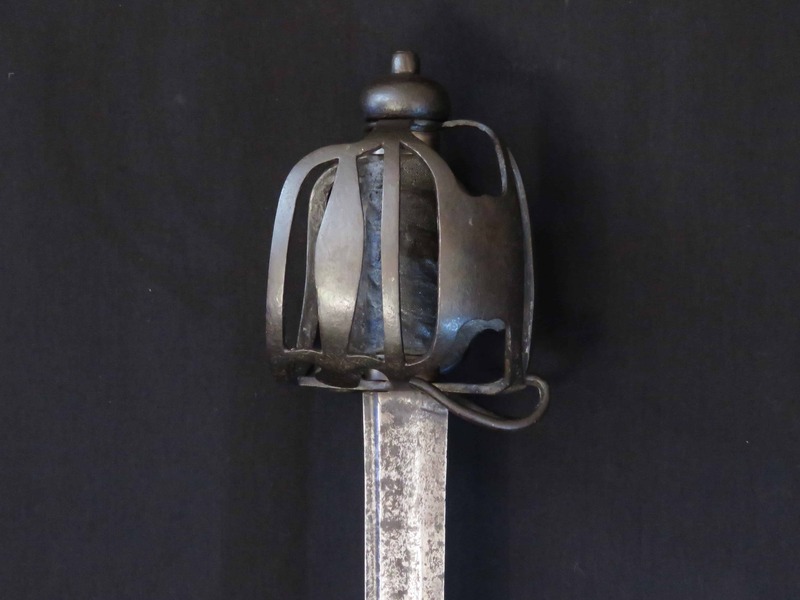 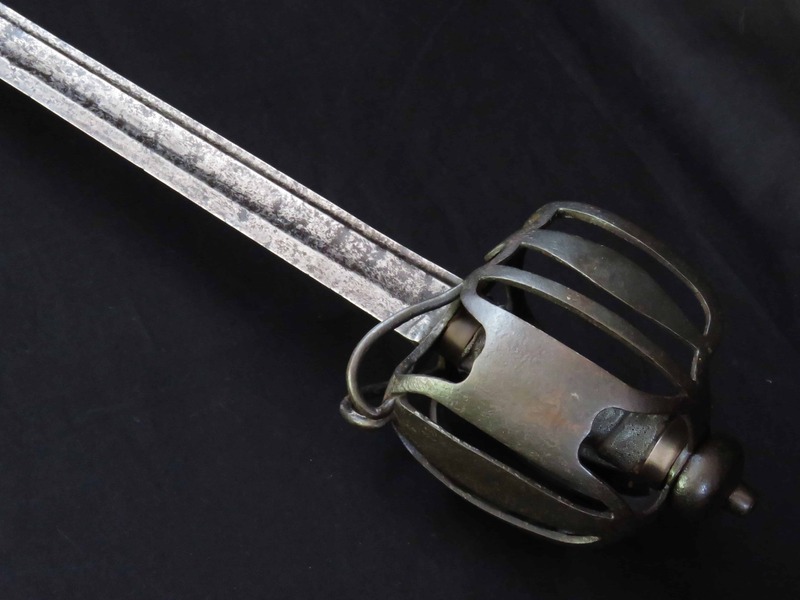 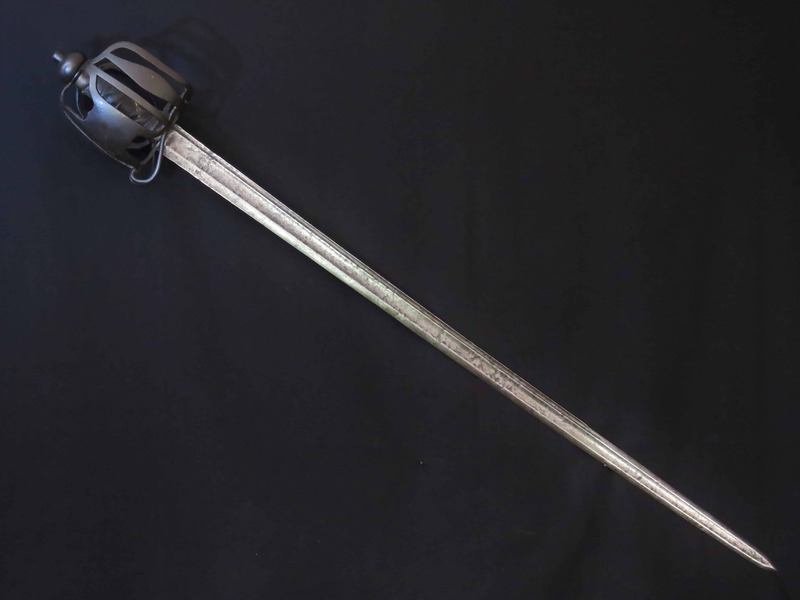 A British basket hilted back sword manufactured for a Trooper in a regiment of horse. 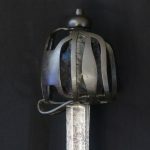 The basket guard is particularly sturdy and well constructed from thick metal still covered with its original protective layer of black paint to the outside. 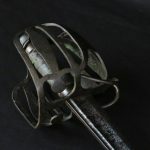 The long, robust, 36 inch blade (91.5 cm) retains its full length and is of typical mid 18th century British type, with a short ricasso, a broad central fuller which extends from the ricasso to the tip, and a narrower, deeper fuller, which extends from the hilt underneath the spine for two thirds of the blade length, after which it becomes double edged. 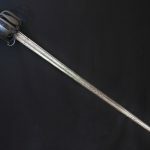 The attractively functional basket guard consists of plain primary and secondary guard plates mounted between structural guard bars of rectangular section. 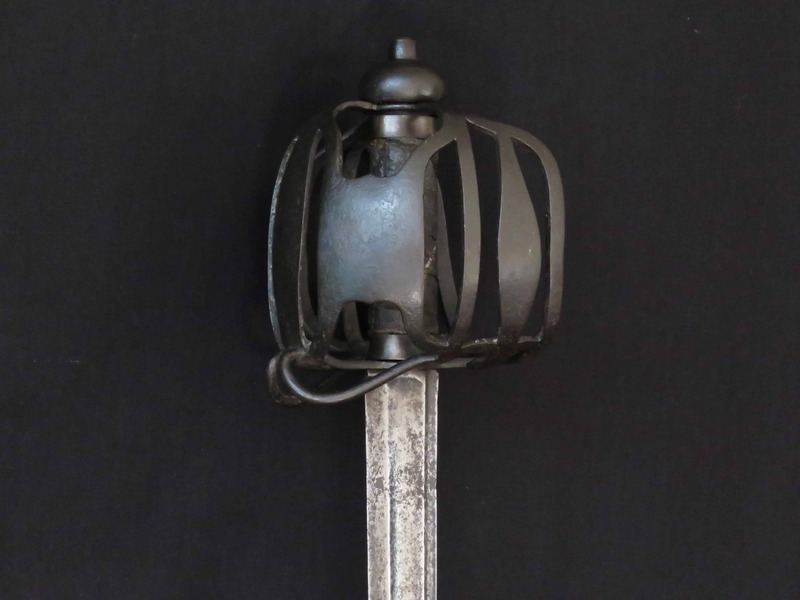 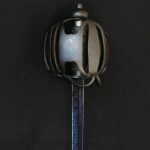 The upper arm terminals of the guard are forged onto a ring of iron into which the base of the bun shaped pommel sits. 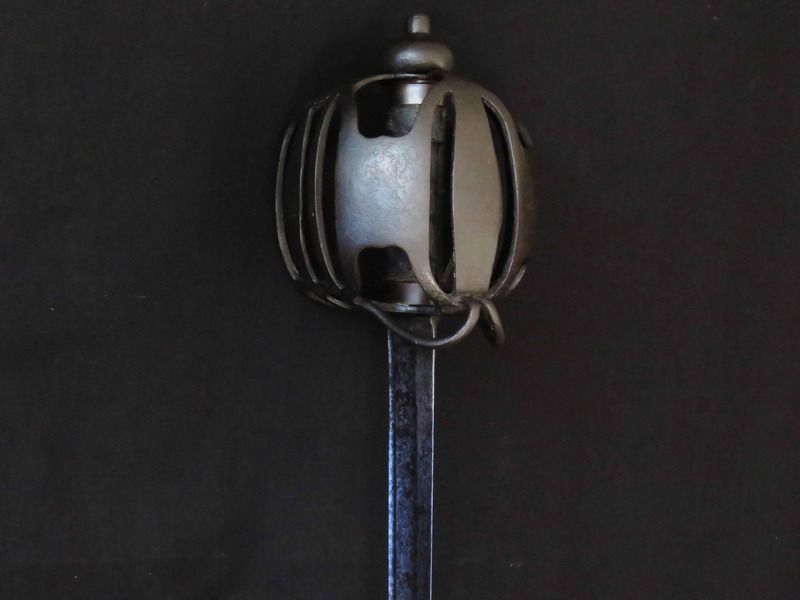 The pronounced plain pommel button is integral, not of separate manufacture. 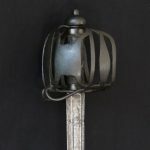 The original grip is of spirally grooved wood and retains its shagreen cover, now distressed in places, and lacks its wire binding. 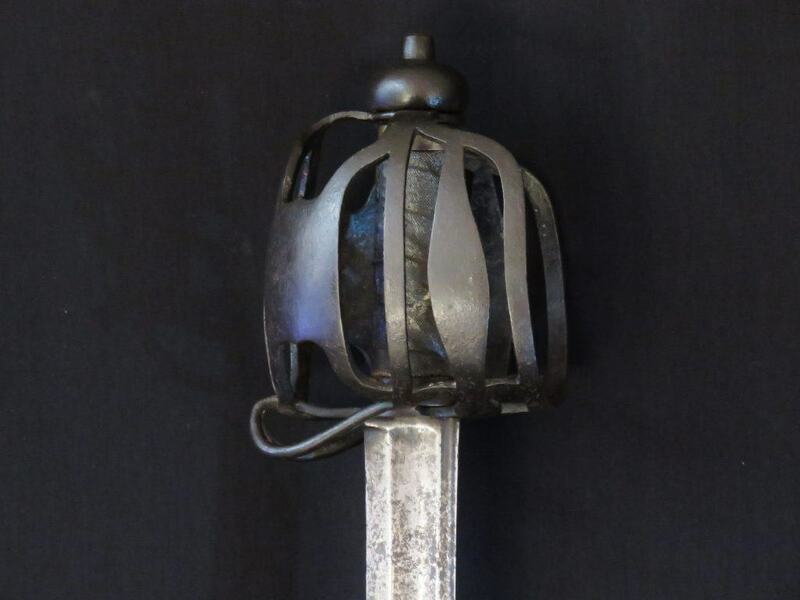 Iron ferrules are mounted top and bottom. 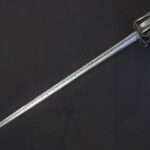 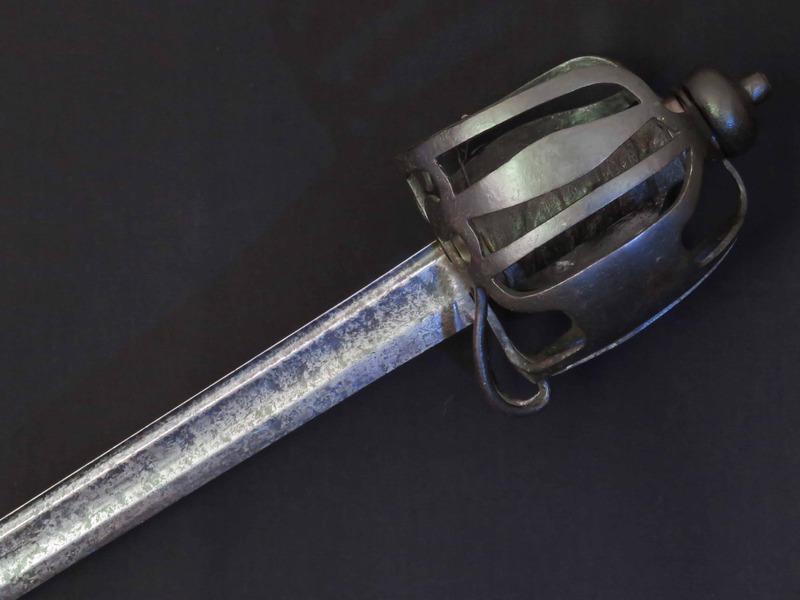 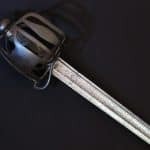 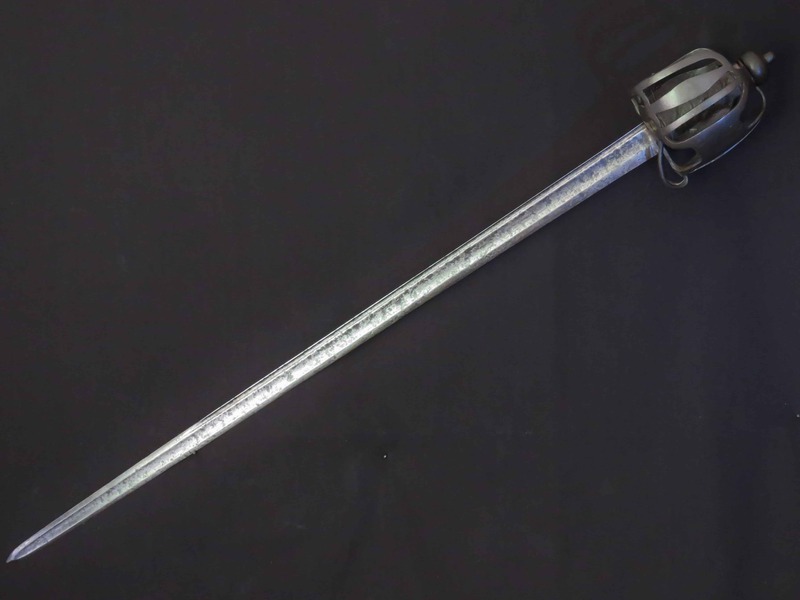 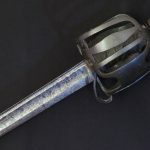 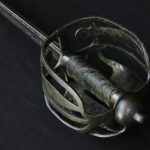 In “A Survey of British Basket-Hilted Cavalry Swords, 1690 – 1760″, page 26 (Royal Armouries Library), Ron McAllister records this plain hilt type, devoid of decoration, with its small peaks to the upper and lower edges of the main guard plates, as the “1751” type hilt for dragoons, and illustrates an example of the 2nd Regiment of Horse. 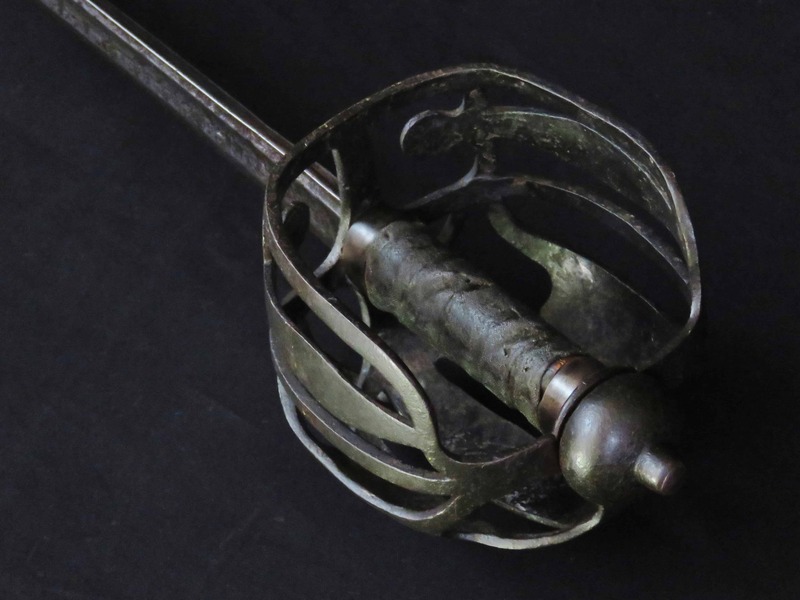 For a similar hilt see “The Swords and the Sorrows”, National Trust for Scotland, 1996, page 48, reference 1:51, in the Royal Armouries Collection. 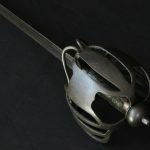 The blade has old, shallow, blackened patches of pitting, consistent with being stored in a scabbard unattended, and otherwise is in good condition, retaining its shape and flex. 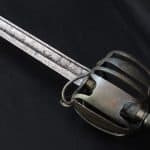 The overall length of the sword is 41.5 inches (105.5 cm).